Today is the last day of Women’s Empowerment Month but women empowering other women doesn’t have to end today. Instead, it’s time to plan for the future and begin to create a world where women feel inspired by their peers, and in turn they can begin to find inspiration within themselves. But that inspiration has to start somewhere and it might as well start with YOU. If you begin to believe in yourself and begin to create the world that you would want to live in, others will do the same. Others will feel that confidence, security, and empowerment, and they will follow in your path. I use to think that the only way to empower other women was through chatting with them, complimenting them, and reminding them how awesome they are. But when I think about the women I’ve looked up to in the past and the women who have empowered me through the years, I always think about the women who walked with their heads held high and never apologized for the path they chose. To me, that confidence within themselves showed greatness. They would walk into a room and demand attention with the confidence they had. And by seeing that and experiencing their confidence firsthand, I found myself emulating many of their positive traits. These women empowered me by simply being their most confident selves. I’ve talked about it a lot already in 2019, but in case you missed it, one of my goals this year is to become more confident. It’s something that doesn’t come overnight and it’s something I have to work at day after day. But I hope finding that confidence within myself to walk with my head held high begins to show through to others and helps them find their own voice and their own path. I truly want to empower other women by becoming the best version of myself. And that takes work. It takes some trial and error, and a few bumps along the way. But I hope someday that emulating those women I looked up to in the past will trickle down to the women I meet along the way. How will you empower other women? I think it’s so important to think about, especially if you are someone out their with young girls in your life. How will you make a difference in the younger generation to create more confident, more empowered women in the next ten years? How will you empower your friend to take a chance? How will you empower a woman you’ve never even met to create a better life for herself? I went to a conference over the weekend that was filled with 1700 other women empowering each other to change their own lives by changing the world, one step at a time. These women are showing others how to create their own businesses and in turn, create more confident versions of themselves. So today I’m pledging to become my most confident self in 2019. To work hard at it day in and day out. Because I hope that this confidence that I know is inside me will soon rub off on others and create even more confident, more empowered women in our daily lives. And while you’re working on empowering others by simply being you, Express is here to make sure you feel like your most confident version of yourself every single day. Express is one of the stores I stop at the most because I can always find apparel that makes me feel amazing. 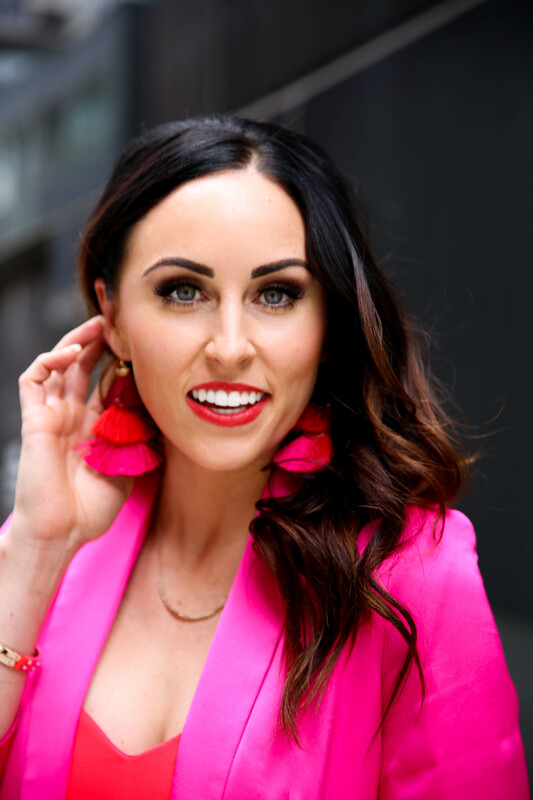 I wore Express clothing all weekend long at the conference I attended, including this hot pink blazer because it made me feel like absolutely amazing. And guess what? Express wants YOU to feel amazing too so you can empower others everywhere. That means right now they are offering a special discount for PaleOMG readers! When you use ring code 8148, you’ll get $25 off $100 in-store AND online! This discount expires 4/15/19 and terms and conditions apply. Go become the best version of yourself and empower others to do the same. Women’s Empowerment Month is every month. We just have to make sure of it! The post Time to Get Empowered Together appeared first on PaleOMG.com.